Pakistan will host the Kangaroos for five-match ODI series in UAE. After an extraordinary start to their Asian campaign, Australia are set to face Pakistan in the second and final chapter of their Asian journey at the United Arab Emirates. The Qantas will face the Greens for a five-match One Day International series between March 22 and March 31, 2019. The series against Pakistan will also be Qantas last ODI series before the ICC Cricket World Cup 2019, which make it even more paramount for the Aussies, and they would love to polish off all scattered edges before the pinnacle event. As per schedule, both Pakistan and Australia will go head-to-head in five ODI games at three Emirates venues; Sharjah Cricket Stadium (Sharjah), the Sheikh Zayed Cricket Stadium (Abu Dhabi) and Dubai International Cricket Stadium (Dubai). All matches will commence from 15:00 Hrs UAE Time (16:30 hrs IST or 22:00 Hrs AEDT). The teams will begin their campaign at the Sharjah Cricket Stadium with two back to back fixtures on March 22 and March 24, 2019, and followed by the third ODI on March 27, 2019, at the Sheikh Zayed Stadium. Then the Dubai International Stadium will witness the last two games on March 29 and March 31, 2019, respectively. 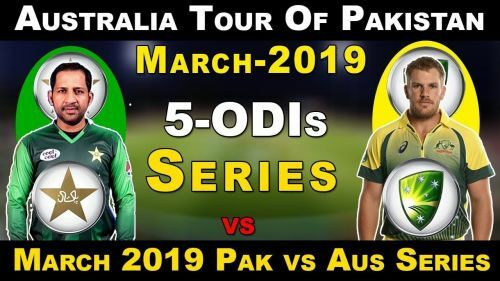 As per the official release on their website, Sony Pictures Sports Network will broadcast all matches of this tour exclusively on its channel Ten Sports in Pakistan, While Fox Sports will telecast its live feed without ad-breaks in Australia on Fox Cricket and streaming lovers can catch the action via Foxtel App. Sony Pictures Network will broadcast all games with English Commentary for their viewers in India on Sony Six and Sony Six HD. While they will also live stream all games in the subcontinent on their OTT platform Sony Liv. While viewers from other locations around the globe can stream these games on Willow TV online and SuperSport Live app. While Rabbitholebd will provide highlights packages for all games on its youtube channel. Meanwhile, following broadcasters will telecast the tournament across other nations of the globe - Super Sports - channel 5 (South Africa), ATN Network (Canada), Willow TV (USA), ESPN (West Indies), Ten Cricket (Sri Lanka), Gazi TV (Bangladesh), OSN Sports (Middle East and North Africa and Fox Sports (Australia).